The majority of LED Strips will begin to fade after 1000 hours, this won't be noticeable until a year or two later, when your warranty has expired. This is because LEDs with just Resistors to protect them is not good enough to ensure a long lifetime. 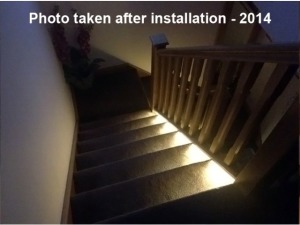 Time and again we hear the same story from people coming to us after having experienced problems with their LED Strip Lights. Our Strip is designed to last using Constant Current Electronics, and in light decay tests has out performed it's rivals from Europe to Asia. With our strip you can expect a useable 50,000+ hour lifetime. The photos below have kindly been sent to us by a long standing customer. We kept the first on file after our customer emailed it to us. We recently requested another photo to confirm how well the strip is performing. 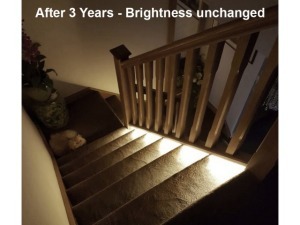 The LED Strip pictured on the stairs has been used every night for 3 years. The photos have been taken with different cameras, the later picture using a new camera. So difference of camera (and settings) aside the photos clearly show the brightness has not changed after 3 years of use. This is because it has additional electronics to prolong the lifetime of the LED Strip which cannot be found on most strips sold elsewhere. So buy from us if you want the best! The pictures below clearly illustrates what will happen with LED Strip if it does not have advanced electronics.